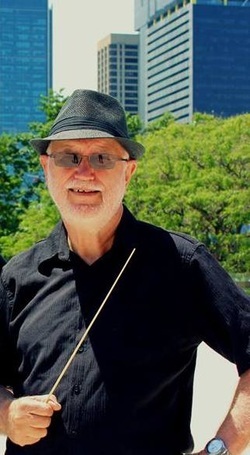 Bernie is an adjudicator and conductor with a very long history of community music. In 1976, Bernie formed the North Brisbane Wind Ensemble at the Kedron Park Teachers College (now QUT), where he was working at the time. The first recruited musicians came by word of mouth, and with fifteen players and borrowed sheet music the band was up and running. Bernie set some grounding values for the ensemble, that after many iterations and an eventful past, is now one of Brisbane's busiest symphonic bands..
Bernie's most recent community conducting was his long time engagement as Music Director for the Brisbane Concert Orchestra. St John Ambulance Concert Band is a non-for-profit community organisation and is comprised of 35-40 musicians with members who range in age from 17 to 80 and come from a diverse range of cultural backgrounds, levels of musicianship, and interests. The band is lucky to be comprised of professional musicians, teachers, doctors, nurses, lawyers, engineers, landscape architects, postal workers and students. St John Ambulance Concert Band has two (2) uniforms: one formal and the other informal. The band's informal uniform is a red polo shirt, black trousers, and a white hat with a red band. Members can purchase the polo shirt and hat from the band's committee for a total of $50. The band's formal uniform is a long-sleeved, white shirt/blouse with a maroon vest and black bow-tie. These are also worn with black trousers. St John Ambulance Concert Band and its small groups have a very busy schedule all year round. The concert band performs regularly for the Brisbane City Council's Bands in Parks program and has a number of recurring annual performances. Bands also perform in our own series of concerts in collaboration with various partners throughout the year. View some of our groups' most recent past performances here.